The image above is the exterior of the Compass Rose Inn. Love the “cheek by jowl” buildings in this town! 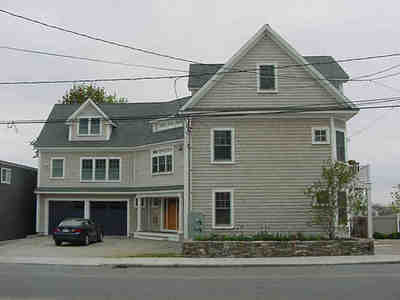 The next house (pic above from a realty website) is a new construction that includes a condo unit on the right. The main house entrance is center. 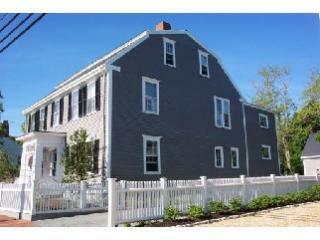 This house overlooking the Merrimack River and Joppa Flats. I used to live on the side street that came out right on this corner – the spectacular view was a daily experience for me. I miss it so! This house is modern and playful, capturing the summer time colors of the waters beyond the windows. On a cold, rainy day, it was warm and inviting. The table settings were the perfect complement to the decor. Note the different green tones on the bar stools in the background. “Heidi Ho” overlooks the kitchen and great room. (Note the street corner out the window – that was the street I lived in an apartment on. I was near the other end. This is an impossible street to turn out of, let me tell you!). Glass mosaic backsplash mimics the waves breaking on the jetty. The powder room featured an illuminated glass bowl. What do you think of this? It was quite beautiful, though I’m not sure I am totally in love with the concept. The next house is a Georgian Gambrel built in 1796. The owners are new and have done a beautiful job creating a modern living space that fits the location and architecture. Looking up towards the front hall. The checkerboard floors are painted. Love the fine details like original (or a very good repro) hardware. This house featured many beautiful, and very natural, displays of greenery and holiday decorations, designed by Jan Lorrey of Nature’s Garden in neighboring Amesbury, MA. This pic is the formal front parlor. The living room (aka front parlor) was a nice example of mixing modern comfort with traditional style. The oil painting showed a gentleman in a fantastic red coat – which of course I couldn’t capture well. But it’s clearly the inspiration for the red touches in the room. The snappy bright white sofa grounds the room so that it doesn’t look too stuffy as these spaces so often do. The front hall featuring the handpainted checkerboard floor. Love the simple black bench and jugs filled with festive berries. This is looking back towards the kitchen table. And now we’re entering the dining room, which featured a pretty spectacular trompe l’oeil marble floor. How fantastic is this wine and bar cabinet??? And love the beautiful dentil crown molding. A lovely natural tablescape and another fantastic oil painting. Sweet little cabinet – note the scalloped shelves. The detail is just to die for! Another view of the floor. I was also struck by the Euro style wall heaters (far right). I’ve never seen these in an antique home but think they are a fantastic replacement for the standard bulky ones that were “retro-fitted” in when central heating was introduced. Now, if they could be custom colored to match the walls they’d be perfection! And a closeup view of a wall heater in the passageway between the dining room and kitchen. And a final view of the stove hood, festooned for the holiday. So, I was originally planning on just showing a few pics from each house – but I’ve clearly gone more in depth. So, this is the end of Part 1 with more to follow. I have an early morning – a rock hit my Jeep’s windshield and they are coming to replace it first thing. And later tomorrow I’m heading up to Logan airport to pick up my brother Don who is in from Colorado. We only get to see him once a year – so I’m very excited!